Patrice Latyr Evra (French pronunciation: ​[pa.tʁis e.vʁa]; born 15 May 1981) is a French professional footballer who most recently played for English club West Ham United and has represented the France national team. Originally an attacker, he primarily plays as a left-back. Evra, whom Sir Alex Ferguson praised for his leadership, also describing him as one of the best left-backs in Europe, has served as captain for both Manchester United and France. The son of a diplomat, Evra was born in Senegal and arrived in Europe when he was a year old. He was raised in France and began his football career playing for various clubs in the Île-de-France region such as hometown club CO Les Ulis and CSF Brétigny. In 1997, he had a stint at professional club Paris Saint-Germain. A year later, Evra seized his first footballing opportunity in neighbouring Italy when he signed his first professional contract with Marsala in Sicily. He made his professional debut with the club and, in the ensuing season, joined Monza. After a year playing with Monza, Evra returned to France to play for Nice. Originally a midfielder, while playing at Nice, he was converted into a full-back. In 2002, Evra joined Monaco and contributed to the club that won the Coupe de la Ligue in 2003. He also featured in European competition for the first time in his career and, in the 2003–04 season, was the starting left-back on the Monaco team that reached the 2004 UEFA Champions League Final. In that same season domestically, Evra was named the National Union of Professional Footballers (UNFP) Ligue 1 Young Player of the Year. He was also named to the organisation's Ligue 1 Team of the Year. Evra's performances with Monaco culminated into a move to English club Manchester United in January 2006. While playing for Manchester United, Evra won a slew of trophies, including the League Cup in his debut season at the club. In his second season, he eclipsed compatriot Mikaël Silvestre and Gabriel Heinze as first-choice left-back and has since won five Premier League titles, one UEFA Champions League title, one FIFA Club World Cup, three League Cups and four Community Shield titles. Evra has been named to the Professional Footballers' Association (PFA) Team of the Year on three occasions. For his performances during the 2008–09 season, he was named to both the FIFPro World XI and the UEFA Team of the Year. After joining Italian side Juventus in 2014, he immediately helped the club to a domestic double and the 2015 UEFA Champions League Final, and won a second domestic double and the Supercoppa Italiana the following season, before moving to Marseille in January 2017. Evra is also a France international. Prior to playing at senior level, he played at under-21 level. He made his senior international debut in August 2004 in a friendly match against Bosnia and Herzegovina. Evra has participated in five major international tournaments for France: the 2008, 2012 and 2016 editions of the UEFA European Championship, winning a runners-up medal at Euro 2016; and both the 2010 and 2014 FIFA World Cups. Ahead of the 2010 World Cup, Evra was named captain of the national team by manager Raymond Domenech and bore the armband for the first time in the team's friendly match against Costa Rica in May 2010. At the tournament, he appeared in two group stage matches, although France endured a disastrous campaign which saw the players go on strike after a first round elimination. The incident resulted in Evra, for his role as captain, being suspended from national team duty for five matches. However, he returned to the squad and enjoyed a successful 2014 World Cup in Brazil under Didier Deschamps as France reached the quarter-finals. "To this day it is the best feeling I have had in football. Not winning the championship or the Champions League but that moment, when I was 17 years old, and I had finally become a professional footballer." Evra, on the moment he became a professional footballer. Evra began his football career playing for hometown club CO Les Ulis. After playing in the streets for years, he was brought to the club by friend Tshymen Buhanga, who informed the club coach, "I bring you the new Romário." Evra spent one year at the club under the watch of coach Jean-Claude Giordanella, who later became vice-president of the club. Giordanella described the player as "more quiet, almost shy. He was a good kid". Evra originally played football in the striker position and, while training at Les Ulis, underwent trials with professional clubs Rennes and Lens. Following the conclusion of the evaluations, Evra was rejected primarily due to his size. In 1993, he joined amateur club CSF Brétigny based in nearby Brétigny-sur-Orge. Similar to his stint with Les Ulis, Evra went on trials with several clubs, most notably Toulouse and Paris Saint-Germain. He was ultimately signed by the latter and converted into a winger. Evra trained at the Camp des Loges for a few months, but was later released. After failing to convince PSG officials of his ability as a footballer, Evra returned to Brétigny and was invited by a friend to participate in an indoor five-a-side football tournament organised by the Juvisy-sur-Orge sports center. While playing, he was spotted by an Italian scout who offered him the opportunity to attend a trial with professional club Torino. Evra spent ten days training with the club and, after the trial, was offered a place on the club's youth team. Afterwards, he was approached by Serie C1 club Marsala, whose officials enticed him with the prospect of becoming a professional. Evra chose the latter option and signed his first professional contract at age 17. He described the moment as "the best feeling I have had in football". Evra spent only one season with the club, appearing in 27 total matches and scoring six goals. After this, he moved to the Serie B level to join Monza for a €250,000 transfer fee after potential moves to Serie A clubs Roma and Lazio fell-through. Evra only appeared in three matches, making his debut on 29 August 1999 in a 2–1 away defeat against Alzano. He left the club following one season after becoming frustrated with his lack of appearances. Evra returned to France joining professional club Nice in Ligue 2, the second division of French football. He spent the majority of his first season with the club playing with its reserve team in the Championnat de France amateur, the fourth level of French football. He primarily played as a midfielder on the team and appeared in 18 matches, scoring one goal. Midway through the campaign, he was called into the first team by manager Sandro Salvioni. He was assigned the number 26 shirt and made his club debut on 7 October 2000 in the team's 7–2 defeat to Châteauroux, starting in the left winger position. Evra made four more appearances during the campaign, appearing as a substitute in defeats to Cannes, Nancy and starting in the team's 3–0 win over Laval and 1–0 loss to Le Havre in the final match of the season. Evra played primarily as centre forward in the matches. In the 2001–02 season, Evra switched to the number 17 shirt and was promoted to the first team on a permanent basis. In the team's first league match of the season against Laval, he started in the team's 2–1 win. Towards the end of the match, reserve left-back Jean-Charles Cirilli, who was starting in place of the regular starter José Cobos, suffered an injury, which required the player to be substituted out. As a consequence, Evra dropped back into the role and played out the rest of the match in the position. Following the match, due to injuries to both Cobos and Cirilli, Evra was informed by Salvioni he would take over the position. The young player disagreed with the manager's decision, declaring he was a forward, however after Salvioni informed him, "If you want to be in the team you play there," Evra agreed to fill the role. Evra made his debut in the position in the team's following league match against Strasbourg, a 3–0 defeat. He appeared regularly in the campaign and, following the return of Cobos, was even allowed to play in his preferred left wing role. [nb 1] With the club in the midst of a promotion battle, Evra scored his first and only goal for Nice in his last match with the club, a 4–3 win over Laval. The victory placed Nice in third place, which resulted in the club earning promotion to Ligue 1 for the first time since 1997. For his performances, Evra was named to the National Union of Professional Footballers (UNFP) Ligue 2 Team of the Year in the left-back position. Didier Deschamps coached Evra during his four-year stint with Monaco. Following the season, Evra was recruited by Nice's Derby de la Côte d'Azur rivals Monaco. Despite wanting to play as a left winger again, Evra was advised by manager Didier Deschamps he would only play as a left-back. Evra has since credited Deschamps for allowing him to become a better defender after initially describing the role as being not fun. Evra was inserted into a back four that consisted of centre-backs Rafael Márquez and Sébastien Squillaci and right-back Franck Jurietti. Evra was assigned the number 3 shirt and made his debut for the club in the opening match of the 2002–03 season against Troyes. He played the entire match in a 4–0 win. On 28 September, Evra scored his first goal for the club, scoring the match-winner in a 2–1 victory against Rennes. On 22 March 2003, he scored his second goal of the season in a 3–0 away win over Le Havre. The victory allowed Monaco to maintain its position at the top of the table, as the club was in a three-way battle with Lyon and Marseille. Monaco climatically conceded first place to Lyon in May, which resulted in Lyon being declared champions for the second time in its history. Monaco finished the campaign in second place, which merited the club an appearance in the UEFA Champions League. The club was also rewarded domestically for its performance in the Coupe de la Ligue where it reached the final. Evra featured in the team's 4–1 win over Sochaux in the match. The league cup title gave Evra the first major honour of his career. After the season, Márquez and Jurietti departed Monaco for Spanish club Barcelona and Bordeaux respectively, and were replaced by Gaël Givet and Hugo Ibarra, the latter joining the club on loan. In the 2003–04 league season, Deschamps installed Evra as a vice-captain and he responded by appearing in 33 matches and providing four assists. Monaco spent six months from September to March in first place, but, like last season, conceded the top spot to Lyon as the season wore on. Evra made his UEFA Champions League debut on 17 September 2003 in the team's opening group stage match against PSV. Evra played the entire match in a 2–1 win. He appeared in all six group stage matches as Monaco finished in first place. [nb 2] For his performances in the first half of the 2003–04 season, Evra was linked with a 2004 winter move to English club Arsenal, Italian clubs Juventus and Milan, and Spanish club Barcelona. After appearing consistently with the team, on 24 March 2004, Evra suffered an ankle injury in the club's 4–2 first leg defeat to Spanish club Real Madrid in the quarter-finals of the Champions League. Evra subsequently missed two weeks in the league, but was healthy enough to return for the team's second leg quarter-final tie against Madrid, which Monaco won 3–1. [nb 3] The win allowed the club advancement to the Champions League semi-finals on the away goals rule. In the semi-finals, Monaco faced English club Chelsea. Evra appeared in both matches as Monaco advanced to the final, beating the London club 5–3 on aggregate. In the 2004 UEFA Champions League Final, Monaco were pitted against Porto at the Arena AufSchalke in Gelsenkirchen, Germany. The club was defeated 3–0 by Porto. Evra played the full 90 minutes. After the season, Evra was given the UNFP Young Player of the Year award, becoming only the second defender and the first since 1997 (Philippe Christanval) to win the award. He was also named to the organisation's Ligue 1 Team of the Year. Despite missing out on playing in UEFA Euro 2004, Evra endured a tumultuous summer in which the player was linked with moves with Manchester United in England, and Juventus and Internazionale in Italy. Despite offers, Evra remained at Monaco. On 24 September 2004, he signed a one-year contract extension with the club until 2008. In the season, Evra was a regular appearing in a career-high 52 matches scoring one goal and assisting on seven as Monaco reached the semi-finals in both the Coupe de la Ligue and Coupe de France. Evra scored his only goal of the season on 8 January 2005 in the team's round of 64 Coupe de France match against amateur club AC Seyssinet-Pariset. He netted the opener in a 7–0 win. In the Champions League, Monaco reached the first knockout round, where they suffered defeat to PSV 3–0 on aggregate. Evra appeared in nine of the ten matches the team contested in the competition. In April 2005, Evra confirmed he was interested in departing the club, stating, "I will have a decision to make for the rest of my career... If attracted clubs show concrete interest, I will think about it seriously." Despite several clubs declaring interest in Evra, Deschamps declared he would not be sold. At the start of the 2005–06 season, Monaco struggled falling to 15th place after only a month of play. On 21 December 2005, Evra made his final appearance with the club in a 1–0 win over Lille in the Coupe de la Ligue. On 27 December, French sources revealed that Manchester United was interested in signing Evra. Despite rumours of Monaco reaching a transfer agreement with Internazionale, on 3 January 2006, Evra revealed he preferred to move to England to join Manchester United. The following day, Manchester United officially issued a transfer bid for the player. On 6 January, United manager Sir Alex Ferguson confirmed a deal for Evra was reached. Four days later, the transfer was official as Evra joined the club for a transfer fee of around £5.5 million and signed a three-and-a-half-year contract. Evra's arrival signalled Ferguson's intention to shore up the club's defence that had suffered since the sidelining of Gabriel Heinze. After joining the club, Evra affirmed that Manchester was his only future destination: "I was not very keen to go forward in the talks with Arsenal, Liverpool or Real Madrid. They all talked with my agent in the past two seasons. But to me, it was over. As I said to the Monaco officials, I only wanted to hear about Manchester." Evra initially had some problems adapting to the English game. He made his debut for the club on 14 January in a 3–1 away defeat to Manchester City in the Premier League. He was substituted out at half-time after failing to make an impact. After the conclusion of the match, Ferguson stated, "Maybe it was a bit of a gamble playing Evra," while the player himself admitted that "playing for Manchester United was something I was not prepared for". Despite the initial set-back, Evra started in the team's ensuing match against Liverpool, a 1–0 victory, and was praised for his performance by teammate Rio Ferdinand. On 26 February, Evra appeared as a substitute in United's 4–0 win over Wigan Athletic in the 2006 League Cup final. On 2 March, it was reported that Liverpool defender Steve Finnan had racially abused Evra in the match. The abuse claims surfaced from two deaf television viewers lodging a police complaint. The viewers claimed to have lip-read Finnan abusing Evra during the televised match. Finnan denied the charge and, after an investigation, The Football Association (FA) decided against charging the player. Evra regularly alternated between the bench and the starting 11 to close out the campaign. He finished the season with 14 total appearances for his new club. In Evra's first full season as a Manchester United player, he struggled to consistently appear as a starter early on in the season as Ferguson preferred Evra's compatriot Mikaël Silvestre. After appearing as an unused substitute in United's first two Champions League matches, on 17 October 2006, Evra made his European debut for the club in its 3–0 group stage win over Copenhagen. On 18 November, he provided the assist for the game-winning goal, scored by Wayne Rooney, in the team's 2–1 win over Sheffield United. Eight days later, Evra scored his first goal for the club in a 3–0 league win over Everton. He also assisted on a goal in the match. By December, Evra began featuring as a regular in the starting 11. 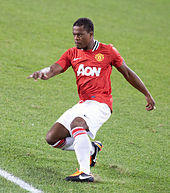 After starting in United's 3–1 Champions League win over Benfica on 6 December, Evra started nine consecutive matches. Evra provided assists in two of the matches; a Rooney goal in a 2–1 away defeat to Arsenal and another in a 2–0 victory over Charlton Athletic. On 10 April 2007, Evra scored the final goal in a 7–1 win over Roma in the second leg of the quarter-finals of the 2006–07 UEFA Champions League. The goal was his first-ever in the Champions League and helped progress Manchester United to the semi-finals, where the club suffered defeat to the eventual champions Milan. Following the league season, which Manchester United won by a six-point margin, Evra was named to the Professional Footballers' Association (PFA) Team of the Year, despite only appearing in 24 league matches. Evra began the 2007–08 season as the first-choice left-back. He began the campaign appearing in United's 3–0 penalty shoot-out win over rivals Chelsea in the 2007 FA Community Shield. In competitive matches, Evra appeared in the club's first 12 matches. He missed his first match of the season against Ukrainian club Dynamo Kyiv in the Champions League after suffering a calf injury during warm-ups. Evra returned to the team a few days later for the team's league match against Arsenal. The rest paid off as he assisted on a Cristiano Ronaldo goal in the 82nd minute to give United a 2–1 lead. France teammate William Gallas later equalised for Arsenal to draw the match at 2–2. In the return match against Dynamo Kyiv in the Champions League, Evra provided the assist for one of the goals in a 4–0 victory. Though he made 48 appearances in all competitions, Evra failed to score a goal. Manchester United clinched its second consecutive Premier League title on the final day, edging Chelsea by two points. The club later completed the double after defeating the same club on penalties in the 2008 UEFA Champions League Final. Evra made ten appearances in the competition, which included playing the entire 120 minutes in the final. After the season, on 12 June, he signed a four-year contract extension with Manchester United, a deal that was set to keep him at Old Trafford until 2012. 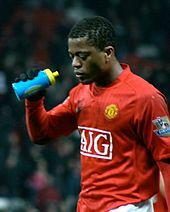 Prior to the start of the 2008–09 season, on 18 July 2008, Evra was charged with four separate counts of improper conduct by the FA. The charges were related to an incident that occurred during the 2007–08 season when Evra had an altercation with a Chelsea groundsman during a warm-down following a match on 26 April. The defender denied the charges and was supported by several members of the club's staff, who commented that the player was racially abused by the groundsman prior to the confrontation. Evra remained free to play for United up to the date of the hearing despite the charges being made in July 2008. He began the campaign in similar fashion to last season as Manchester United won the Community Shield following the team's 3–0 victory over Portsmouth on penalties. Evra was ever-present in Manchester United's first 22 competitive matches of the season, starting 19 of them. At the hearing on 5 December, Evra was found guilty of improper conduct, and handed a four-match ban – due to start on 22 December 2008 – and a £15,000 fine. Despite the suspension, Evra still featured with Manchester United in December as the club participated in the 2008 FIFA Club World Cup. He appeared in both matches the team contested as United came out as champions after defeating Ecuadorian club LDU Quito in the final. Evra temporarily returned to the team domestically for its home match, coincidentally, against Chelsea on 11 January 2009. In the match, Evra assisted on the second goal in a 3–0 victory. He was later forced to leave the match due to a foot injury, which was later discovered to be serious. Evra missed a month and returned to the line-up on 15 February in a 3–0 win over Fulham. Evra subsequently appeared in every remaining competitive match for United, excluding an April league match against Sunderland, as the club cruised to its third consecutive Premier League title, won the League Cup, and reached the 2009 UEFA Champions League Final after defeating league rivals Arsenal 4–1 on aggregate in the semi-finals. Following the second leg against Arsenal, Evra was asked his opinion of the team's 3–1 second leg victory, and declared, "It was 11 men against 11 babies. We never doubted ourselves." The final marked Evra's third appearance in Champions League finals as Manchester United lost 2–0 to Barcelona. At the end of the season, Evra was included in the PFA Team of the Year for the second time. For the first time in his career, Evra appeared in all 38 league matches in the 2009–10 season. The campaign initially began badly for him after he delivered a soft penalty shot, described by some in the media as "awful", in the team's penalty shoot-out defeat to Chelsea in the 2009 FA Community Shield. Due to injuries to Rio Ferdinand, Gary Neville and Ryan Giggs, he captained the team in several matches during the season wearing the armband for the first time in his Manchester United career in the team's 3–1 Champions League victory over VfL Wolfsburg. In December 2009, Evra was among three Manchester United players named to the FIFPro World XI for the 2009 calendar year, before being named to the UEFA Team of the Year in January 2010. On 28 February 2010, Evra captained Manchester United to a 2–1 win against Aston Villa in the 2010 League Cup final. The league cup title was Evra's fourth overall as well as his first title earned as a captain. He also became only the second Frenchman after Eric Cantona to captain a Manchester United team to victory in a major competition. In league play, Manchester United failed to win its fourth-straight league title, conceding the honour to Chelsea. The club also failed to reach the Champions League final for their third-straight final appearance, losing to German champions Bayern Munich in the quarter-finals. Early on during the 2010–11 season, Evra was hampered by constant inquiries about what happened at the 2010 FIFA World Cup from the French Football Federation (FFF), the French media, as well as the French government. Evra's contract with Manchester United was also up at the end of the 2011–12 season, which led to the player being linked with a move to Real Madrid. Evra's hearing with the FFF in Paris, which he attended, was held the day after the team's opening 3–0 league win over Newcastle United. Evra played over 85 minutes in the match. On 20 November, Evra scored his second Premier League goal in a 2–0 win at home against Wigan Athletic. On 21 February 2011, after weeks of negotiations, Evra signed a contract extension with Manchester United that would keep him with the club until at least the end of the 2013–14 season. Two days after signing his contract extension, Evra participated in United's 0–0 draw with Marseille in the first leg of the team's first knockout round tie in the Champions League. The match, played at the Stade Vélodrome in Marseille, was Evra's first match played in France since the 2010 World Cup debacle. As a consequence, he was subjected to a barrage of jeers and boos every time he touched the ball. At the start of the 2011–12 season, Evra helped United win the 2011 Community Shield against Manchester City on 7 August. Despite being caught out in the first half by a header from Joleon Lescott and a long-range Edin Džeko strike that put City into a 2–0 lead, United rallied in the second half and won 3–2 to claim the Shield. On 15 October, Evra captained Manchester United in the club's 1–1 draw away to Liverpool. Following the match, in an interview with French television channel Canal+, Evra asserted that Liverpool player Luis Suárez had racially abused him multiple times during the match. He also stated that he had informed referee Andre Marriner of the incidents at the conclusion of the match. The following day, the FA announced it would investigate the claim, and on 17 November, the FA announced it would charge Suárez with "abusive and/or insulting words and/or behaviour contrary to FA rules", including "a reference to the ethnic origin and/or colour and/or race of Patrice Evra". During the 2012–13 season, despite being just 174 cm (5 ft 9 in) tall, Evra built up a reputation as an attacking threat at corners, doubling his goals tally from his previous seven years at the club with three headed goals from corners in the space of 13 games, against Newcastle United, Arsenal and Swansea City. He continued this run into the 2013–14 season, heading home against Cardiff City on 24 November 2013. In addition to the headers, Evra has also scored twice from open play since the start of the 2012–13 season, the first a low drive from just outside the penalty area against Newcastle on Boxing Day 2012, and the second a curling, right-footed effort against Stoke City in the fifth round of the League Cup almost a year later. On 23 May 2014, Evra signed a new one-year contract extension that would have kept him at Manchester United until at least the summer of 2015. Evra battles Barcelona forward Lionel Messi for the ball during the Champions League final in June 2015. On 21 July 2014, Evra joined Italian Serie A club Juventus on a two-year contract. The fee was £1.2 million, which rose to £1.5 million, after Juventus qualified for the 2015–16 UEFA Champions League. On 14 December 2014, he scored his first goal for the club, opening the scoring of a 1–1 home draw to Sampdoria. On 6 June 2015, Evra started for Juventus in the 2015 UEFA Champions League final as Juventus were defeated 3–1 by Barcelona at Berlin's Olympiastadion. The match was the fifth Champions League final in which he had appeared, and the defeat meant he became the first player to lose four Champions League finals. Evra made his 100th UEFA Champions League appearance in a 1–0 home win over Manchester City on 25 November 2015, becoming the second French player to do so after Thierry Henry. Evra scored a goal in the last match of the 2015–16 Serie A season on 14 May 2016, in a 5–0 home win over Sampdoria, as Juventus celebrated winning the league title for a fifth consecutive time since the 2011–12 season. On 6 June 2016, Evra signed a one-year contract extension with Juventus; the deal included an option for a further extension of one year. On 25 January 2017, Evra joined Marseille on a free transfer, signing an 18-month contract with the club. In warm-ups preceding a Europa League match on 2 November 2017, Evra was sent off for kicking a spectating Marseille fan in the head, who was reportedly "ridiculing" him as he trained. Marseille coach Rudi Garcia was critical of the fans, but also criticized Evra for reacting to the provocation. On 3 November, the day after Evra's altercation with a fan, he was suspended from playing indefinitely by Marseille, pending an interview with the player regarding his conduct and further investigation before any other sanctions are imposed on him. Marseille released a statement concerning the incident, condemning Evra's actions. He has also received a charge of violent conduct from UEFA as a consequence. Evra also received a UEFA ban that made him ineligible to play in any UEFA competitions until June 2018. Marseille subsequently terminated Evra's contract with immediate effect. On 7 February 2018, West Ham United signed Evra on a free transfer. He signed a contract until the end of June 2018. On 24 February 2018, he made his club debut against Liverpool. Evra departed West Ham United when his contract expired at the end of the season, having made 5 appearances for the club. Evra is a former French youth international having played for the under-21 team. Due to harboring in Italy during his development years, he failed to earn call-ups with teams below the under-21 level. Evra earned his first call-up to the under-21 team under coach Raymond Domenech on 3 October 2002 for matches against Slovenia and Malta. He made his under-21 debut in the match against Slovenia as France cruised to a 1–0 victory. Evra was forced to miss the match against Malta after suffering an injury in the win over Slovenia. The defender regularly appeared for the team through 2002–2004 as France attempted to qualify for both the 2004 UEFA European Under-21 Football Championship and the football tournament at the 2004 Summer Olympics. France failed to qualify for both competitions, which resulted in the end of Evra's youth career. Evra earned his first call-up to the senior national team in May 2004 after coach Jacques Santini named him to the 31-man preliminary squad to participate in UEFA Euro 2004. Following the trimming of the squad to 23 players, Evra was not included and subsequently missed out on the competition. Following the European Championship, with former under-21 coach Domenech now coaching the team, Evra was called up to the senior team for its friendly against Bosnia and Herzegovina on 18 August 2004. The defender admitted that he was "very proud" to have been called up to the team. Evra made his senior international debut in the match against Bosnia and Herzegovina. He started on the left wing before being substituted out in the 75th minute for Robert Pires. The match ended in a 1–1 draw. 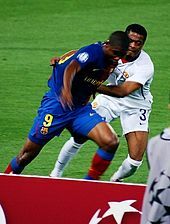 Due to an injury to starter Eric Abidal, Evra supplanted him and appeared as the starting left-back in France's first two 2006 FIFA World Cup qualification matches. After being called-up for the team's March 2005 friendly against Switzerland, Evra was forced to withdraw from the team due to injury. As a result, William Gallas was inserted in the role as a makeshift left-back. Following Abidal's return from injury and, due to Domenech preferring Mikaël Silvestre as the incumbent's back-up, Evra went without a call-up for almost two years and, consequently, missed the 2006 World Cup. In October 2007, the defender explained to L'Équipe that the World Cup snub "gave me my determination". Evra returned to the team in November 2006 for the team's friendly match against Greece. He appeared as a half-time substitute for Abidal as France won the match 1–0. After going another year without representing France, Evra began appearing as a regular under Domenech in 2007. On 28 May 2008, he was included in the squad to participate in UEFA Euro 2008. He was initially placed onto the squad to serve as back-up to Abidal, however after failing to appear in the team's opening 0–0 draw with Romania, there were calls from the French media urging Domenech to insert Evra into the starting line-up at the behest of Abidal. Domenech relented and started Evra in the team's next match against the Netherlands, which ended in a 4–1 defeat. In the must-win final group stage match against Italy, Evra started his second consecutive match, but France lost 2–0 and were eliminated from the competition in the first round. Following the match, cameras witnessed Evra and teammates Patrick Vieira and Abidal getting into an altercation in the tunnel. Vieira later stated the video was shot after he got into an argument with a set of French supporters. A day after the team's elimination, Evra admitted his frustration to L'Équipe, stating, "I am someone who does not like losing but I'm not going to make excuses. We had three games in this Euro, we have not won one. It's even hard to believe, to say it's over now." "Tonight it's time for the big apology towards the thousands of French people, because I share the pain of all these French people. What hurts even more is that this apology should have been made yesterday, but my coach stopped me doing it as a captain, and that hurts even more. But it won't change anything, now is not the time to settle scores. I have nothing to hide. The French team doesn't belong to anyone, it belongs to all of these French people. People need to know the truth, the causes of this enormous disaster." Evra, commenting following France's elimination from the 2010 FIFA World Cup. After Euro 2008, defensive stalwart Lilian Thuram retired from the team. To mitigate his absence, Domenech moved Abidal into the centre-back position, allowing Evra to take over as starting left-back. In the team's first competitive match since Euro 2008, against Austria, Evra provided the assist for France's only goal scored by Sidney Govou in a surprising 3–1 defeat. During the 2010 FIFA World Cup qualification campaign, Evra participated in ten of the team's 12 matches, which included both legs in the team's playoff round win over the Republic of Ireland. On 26 May 2010, Evra captained the national team for the first time in a friendly match against Costa Rica; France won the match 2–1. He was subsequently named the captain for the 2010 World Cup ahead of Thierry Henry, who was relegated to the bench for the tournament. Evra wore the armband in the team's first two matches, a 0–0 draw with Uruguay and a 2–0 loss to Mexico. On 19 June, striker Nicolas Anelka was dismissed from the squad after reportedly having a dispute, in which obscenities were passed, with Domenech during half-time of the team's loss to Mexico. The resulting disagreement over Anelka's exclusion between the players, the coaching staff and France Football Federation (FFF) officials resulted in Evra leading a player protest against the decision on 20 June, in which the players refused to train. Prior to leading the revolt, Evra had got into a verbal argument with national team fitness coach Robert Duverne. The strike was denounced by the FFF as well as French government officials. The following day, the players returned to training without incident. As a result of the mutiny, Evra was stripped of the captaincy and benched for the team's final group stage match against hosts South Africa. France lost 2–1 and were eliminated from the competition. Following the competition, former national team captain Lilian Thuram stated that Evra should be banned permanently from playing for the national team. His sentiments were later echoed by Sports Minister Chantal Jouanno, who declared, "I have nothing against Evra but, as a France player and especially captain, he did not defend the values of sport which are shared by the Republic. I am sure there exist other talents who have not sullied France and are waiting for/ the chance to write new history". On 6 August, Evra was one of five players summoned to attend a hearing held by the Disciplinary Committee of the FFF in response to the team's strike at the World Cup. On 17 August, he received a five-match international ban for his part in the incident. As a result of being captain, Evra bore the brunt of the criticism. However, despite the public ridicule, Evra maintained his stance regarding his future with the national team, stating, "I can’t see my future without the France team." On 17 March 2011, he was called up to the national team by new manager Laurent Blanc for the first time since the 2010 World Cup. He had been eligible to return to the team since the previous month after serving his five-match suspension, however he was not called up to the team by Blanc, with the manager citing "sporting reasons" as the reason. Evra made his return to the team on 25 March in the team's Euro 2012 qualifying match against Luxembourg. He started the match and played the full 90 minutes in a 2–0 win. Four days later, Evra appeared on the bench in his first match at the Stade de France since the World Cup, against Croatia. After appearing regularly in qualifying for Euro 2012, on 29 May 2012, he was named to the 23-man squad to participate in the finals of the competition. France were eliminated in the quarter-finals following a 2–0 defeat against eventual champions Spain. Evra played four of France's five matches at the 2014 World Cup, in which they were eliminated in the quarter-finals by the eventual champions Germany. In May 2016, Evra was named to national team manager Didier Deschamps's 23-man France squad for Euro 2016, to be played on home soil. On 10 June, he was later included in the starting line-up for France's opening match of the tournament against Romania, playing the entire 90 minutes of the fixture. With France leading 1–0, Evra fouled Nicușor Stanciu in the penalty box; Bogdan Stancu scored the resulting penalty in the 65th minute. The hosts eventually won the match 2–1, although Evra was later criticised for his performance. In the semi-final against Germany on 7 July, Evra drew praise from the media as he helped win a penalty for his team and produced a strong defensive performance to help France keep a clean-sheet and defeat the reigning world champions 2–0 to advance to the final of the competition. Following the victory, he was also lauded for his leadership and his role in using his experience to unite the team. In the final, France suffered a 1–0 extra-time defeat to Portugal. Regarded as one of the best players in the world in his position during his prime, Evra is a fast, energetic and athletic left-back, who, despite his size, is physically strong, and good in the air, which also allows him to be deployed as a centre-back on occasion; in addition to his physical attributes, he is also comfortable on the ball and adept at getting into attacking positions as a wing-back, where he can deliver crosses to teammates, having functioned as a winger earlier on in his career. An aggressive, tactically intelligent, versatile and hard-working player, he is also renowned for his leadership and tenacity on the pitch. These attributes make him effective both offensively and defensively. Evra was born in Dakar, the capital city of Senegal, to a father of Guinean descent and Juliette, a Cape Verdean mother. He is one of a total of 25 children, although two are now deceased. Evra's father was a diplomat and, when Evra was a year old, moved to Brussels in Belgium to work at the Senegalese embassy. After over two years living in Belgium, when Evra was three, the family moved to France and settled in Les Ulis, a commune south of Paris. The family first settled in the local Bergeries neighbourhood before moving to the Hautes Plaines quarter shortly after. Evra was raised on Senegalese culture and values that quickly became "Westernised". At age 10, he returned to Senegal for a short period, describing the return as "not a good experience" primarily because he ventured back to the country to undergo circumcision. He had not returned to the country as of 2011. Ahead of the 2010 World Cup, Evra revealed he had suffered racial abuse from supporters of the Senegal national team for choosing to represent France internationally over his country of birth. Evra is allergic to eggs, a condition which he did not discover until an examination by Juventus. Evra developed an interest in football at a young age and was fascinated by the play of former Brazilian international Romário, though he never really had an idol. He also earned good marks in school. Evra is married to Sandra with whom he has a son, Lenny and a daughter, Maona. He speaks five languages: his native French, English, Italian, Spanish and Portuguese. He also attempted to learn Korean in order to better communicate with Park Ji-sung, his former South Korean teammate at Manchester United. Evra participated in the Shoot for Love Challenge raising vital funds for children suffering from cancer, organised by the Guus Hiddink Foundation. In March 2019, Evra denied making homophobic comments against PSG. ^ Nice matches in which both starting left-back José Cobos and Evra appear in the starting line-up are tallied in the attached sources. ^ The six UEFA Champions League group stage matches Evra appeared in are tallied in the attached sources. ^ Monaco league matches Evra missed due to the injury suffered in the Real Madrid quarter-final first leg, which equated to two weeks, are tallied in the attached sources. ^ "Premier League clubs submit squad lists" (PDF). PremierLeague.com. Premier League. 2 February 2012. p. 23. Retrieved 2 February 2012. ^ "Patrice Evra". ESPN FC. ESPN Internet Ventures. Retrieved 4 January 2019. ^ a b c d e "Patrice Evra". ESPN FC. ESPN Internet Ventures. Retrieved 7 April 2011. ^ a b "Evra, il rinnovo è ufficiale" (in Italian). sport.libero.it. Archived from the original on 18 August 2017. Retrieved 13 September 2014. ^ "After torrid World Cup, Evra embroiled in controversy yet again". Sports Illustrated. Time. 21 October 2011. Archived from the original on 21 December 2011. Retrieved 21 December 2011. ^ a b c d e f g h i Lawton, Matt (1 May 2010). "Patrice Evra on Sir Alex Ferguson's hair dryer, Carlos Tevez and more..." Daily Mail. UK: Associated Newspapers. Retrieved 7 April 2011. ^ a b c d e Zouaoui, Farid (26 May 2004). "Patrice Evra, le petit prince des Ulis". Le Parisien (in French). France: Éditions Philippe Amaury. Retrieved 7 April 2011. ^ a b "Les Ulis se souviennent d'Evra et d'Henry". Le Parisien (in French). France. 26 May 2009. Retrieved 7 April 2011. ^ "Patrice Evra: La face cachée des Bleus". Linternaute (in French). 10 June 2010. Retrieved 1 June 2011. ^ "Le PSG ne veut plus rater un Evra ou un Diaby". Foot01 (in French). France. 29 March 2011. Retrieved 1 June 2011. ^ a b c d e f g "From Dakar to Old Trafford, via Paris, Milan (just), Sicily and Stamford Bridge". The Guardian. London. 22 January 2006. Retrieved 8 April 2011. ^ "Calciobidoni – Tutti i bidoni del calcio italiano – Evrà" (in Italian). Calciobidoni. Retrieved 16 April 2011. ^ "Mondo CALCIO – Serie B 1999/2000: Alzano–Monza". RAI Sport (in Italian). RAI. Retrieved 13 September 2011. ^ "O.G.C. Nice Reserve Pro: Saison Football 2000/2001". Stat 2 Foot (in French). Archived from the original on 2 April 2012. Retrieved 7 April 2011. ^ "Châteauroux v. Nice Match Report". LFP.fr (in French). Ligue de Football Professionnel. 7 October 2000. Retrieved 7 April 2011. ^ "Cannes v. Nice Match Report". LFP.fr (in French). Ligue de Football Professionnel. 28 October 2000. Retrieved 7 April 2011. ^ "Nancy v. Nice Match Report". LFP.fr (in French). Ligue de Football Professionnel. 9 December 2000. Retrieved 7 April 2011. ^ "Nice v. Laval Match Report". LFP.fr (in French). Ligue de Football Professionnel. 21 December 2000. Retrieved 7 April 2011. ^ "Le Havre v. Nice Match Report". LFP.fr (in French). Ligue de Football Professionnel. 18 May 2001. Retrieved 7 April 2011. ^ "Patrice Evra, le latéral gauche de référence". Footballfr (in French). 3 October 2009. Archived from the original on 26 March 2012. Retrieved 1 June 2011. ^ a b c d e f "Patrice Evra". lequipe.fr (in French). L'Equipe. Retrieved 7 April 2011. ^ a b "Nice v. Laval Match Report". LFP.fr (in French). Ligue de Football Professionnel. 28 July 2001. Retrieved 7 April 2011. ^ "Strasbourg v. Nice Match Report". LFP.fr (in French). Ligue de Football Professionnel. 4 August 2001. Retrieved 7 April 2011. ^ "Le Mans v. Nice Match Report". LFP.fr (in French). Ligue de Football Professionnel. 12 October 2001. Retrieved 1 June 2011. ^ "Martigues v. Nice Match Report". LFP.fr (in French). Ligue de Football Professionnel. 28 November 2001. Retrieved 1 June 2011. ^ "Grenoble v. Nice Match Report". LFP.fr (in French). Ligue de Football Professionnel. 16 February 2002. Retrieved 1 June 2011. ^ "Ajaccio v. Nice Match Report". LFP.fr (in French). Ligue de Football Professionnel. 6 March 2002. Retrieved 1 June 2011. ^ "Gueugnon v. Nice Match Report". LFP.fr (in French). Ligue de Football Professionnel. 23 March 2002. Retrieved 1 June 2011. ^ "Nice v. Amiens Match Report". LFP.fr (in French). Ligue de Football Professionnel. 26 March 2002. Retrieved 1 June 2011. ^ "Nice v. Martigues Match Report". LFP.fr (in French). Ligue de Football Professionnel. 13 April 2002. Retrieved 1 June 2011. ^ "Laval v. Nice Match Report". LFP.fr (in French). Ligue de Football Professionnel. 3 May 2002. Retrieved 7 April 2011. ^ "Evra: Don't believe the hype". Sky Sports. BSkyB. 1 December 2003. Retrieved 7 April 2011. ^ "Troyes v. Monaco Match Report". LFP.fr (in French). Ligue de Football Professionnel. 3 August 2002. Retrieved 7 April 2011. ^ "Monaco v. Rennes Match Report". LFP.fr (in French). Ligue de Football Professionnel. 28 September 2002. Retrieved 7 April 2011. ^ "Le Havre v. Monaco Match Report". LFP.fr (in French). Ligue de Football Professionnel. 22 March 2003. Retrieved 7 April 2011. ^ "Lyon à deux pas du bonheur". La Depeche (in French). 5 May 2003. Retrieved 1 June 2011. ^ "37ème journée de Ligue 1: Lyon champion!". Ados.fr (in French). 24 May 2003. Retrieved 1 June 2011. ^ a b c "Historique". asm-fc.com (in French). AS Monaco FC. Archived from the original on 14 September 2011. Retrieved 1 June 2011. ^ "Sochaux v. Monaco Match Report". LFP.fr (in French). Ligue de Football Professionnel. 17 May 2003. Retrieved 7 April 2011. ^ "Sept Bleuets prennent la reléve". lequipe.fr (in French). L'Equipe. 17 August 2004. Archived from the original on 20 December 2008. Retrieved 1 June 2011. ^ a b "Monaco muscle past PSV". UEFA.com. Union of European Football Associations. 17 September 2003. Archived from the original on 21 July 2012. Retrieved 7 April 2011. ^ "Rampant Monaco end AEK run". UEFA.com. Union of European Football Associations. 30 September 2003. Archived from the original on 12 July 2012. Retrieved 1 June 2011. ^ "Tristán delivers for Deportivo". UEFA.com. Union of European Football Associations. 21 October 2003. Archived from the original on 15 July 2012. Retrieved 1 June 2011. ^ "Depor bewitched by magic Monaco". UEFA.com. Union of European Football Associations. 5 November 2003. Archived from the original on 9 July 2012. Retrieved 1 June 2011. ^ a b "Monaco advance as PSV stay alive". UEFA.com. Union of European Football Associations. 25 November 2003. Archived from the original on 11 July 2012. Retrieved 1 June 2011. ^ "AEK unable to end on a high". UEFA.com. Union of European Football Associations. 10 December 2003. Archived from the original on 10 July 2012. Retrieved 1 June 2011. ^ "Season 2003–2004 Group C". UEFA.com. Union of European Football Associations. Archived from the original on 10 July 2012. Retrieved 1 June 2011. ^ "Milan duo fancy Evra". Sky Sports. BSkyB. 27 January 2004. Retrieved 7 April 2011. ^ "Morientes checks Madrid onslaught". UEFA.com. Union of European Football Associations. 24 March 2004. Archived from the original on 8 July 2012. Retrieved 7 April 2011. ^ "Evra plays down injury fears". Sky Sports. BSkyB. 27 January 2004. Retrieved 7 April 2011. ^ "Le Mans v. Monaco Report". LFP.fr (in French). Ligue de Football Professionnel. 27 March 2004. Retrieved 1 June 2011. ^ "Monaco v. Ajaccio Match Report". LFP.fr (in French). Ligue de Football Professionnel. 2 April 2004. Retrieved 1 June 2011. ^ a b "Madrid felled by Morientes". UEFA.com. Union of European Football Associations. 6 April 2004. Archived from the original on 8 July 2012. Retrieved 7 April 2011. ^ "Ten-man Monaco dazzle Chelsea". UEFA.com. Union of European Football Associations. 20 April 2004. Archived from the original on 11 July 2012. Retrieved 7 April 2011. ^ "Morientes has the final say". UEFA.com. Union of European Football Associations. 5 May 2004. Archived from the original on 8 July 2012. Retrieved 7 April 2011. ^ "Porto 3–0 Monaco". BBC Sport. British Broadcasting Corporation. 26 May 2004. Retrieved 12 January 2011. ^ "Porto perform to perfection". UEFA.com. Union of European Football Associations. 26 May 2004. Archived from the original on 5 January 2013. Retrieved 7 April 2011. ^ "Drogba named France's best". Sky Sports. BSkyB. 3 May 2004. Retrieved 7 April 2011. ^ "L'Equipe type de L1 – 2003/2004". Maxifoot (in French). 30 May 2004. Retrieved 1 June 2011. ^ a b "Premier entraînement pour les Bleus". fff.fr (in French). French Football Federation. 19 May 2004. Retrieved 8 April 2011. ^ "Big guns get set for Evra". Sky Sports. BSkyB. 28 May 2004. Retrieved 7 April 2011. ^ "Inter duo catch Monaco's eye". Sky Sports. BSkyB. 22 June 2004. Retrieved 7 April 2011. ^ "In-demand Evra gets new deal". Sky Sports. BSkyB. 24 September 2004. Retrieved 7 April 2011. ^ "AC Seyssinet-Pariset v. AS Monaco FC Match Report". Footisere (in French). 8 January 2005. Retrieved 7 April 2011. ^ "Alex earns PSV advantage". UEFA.com (in French). Union of European Football Associations. 22 February 2005. Archived from the original on 14 July 2012. Retrieved 7 April 2011. ^ "PSV make most of advantage". UEFA.com (in French). Union of European Football Associations. 9 March 2005. Archived from the original on 10 July 2012. Retrieved 7 April 2011. ^ "Evra eyes big move". Sky Sports. BSkyB. 15 April 2005. Retrieved 7 April 2011. ^ "Monaco v. Lille Match Report". LFP.fr (in French). Ligue de Football Professionnel. 21 December 2005. Retrieved 7 April 2011. ^ "Fergie back on Evra trail". Sky Sports. BSkyB. 27 December 2005. Retrieved 8 April 2011. ^ "United may hold edge in Evra race". Sky Sports. BSkyB. 3 January 2006. Retrieved 8 April 2011. ^ "Bids lodged for Evra". Sky Sports. BSkyB. 4 January 2006. Retrieved 8 April 2011. ^ a b "Fergie: Evra to have medical". Sky Sports. BSkyB. 6 January 2006. Retrieved 8 April 2011. ^ "Evra completes Man Utd transfer". BBC Sport. British Broadcasting Corporation. 10 January 2006. Retrieved 16 May 2008. ^ "Evra completes United move". Sky Sports. BSkyB. 10 January 2006. Retrieved 8 April 2011. ^ "Evra: Only United for me". Sky Sports. BSkyB. 10 January 2006. Retrieved 8 April 2011. ^ "Evra pleads with United and City fans to behave at FA Cup semi-final and make Manchester proud". Daily Mail. Associated Newspapers. 13 April 2011. Retrieved 1 June 2011. ^ "Man City 3–1 Man Utd". BBC Sport. British Broadcasting Corporation. 14 January 2006. Retrieved 16 May 2008. ^ Hyde, Marina (19 January 2006). "Francophile Fergie undone by the logic of languages". The Guardian. London: Guardian News and Media. Retrieved 8 April 2011. ^ "Man Utd 1–0 Liverpool". BBC Sport. British Broadcasting Corporation. 22 January 2006. Retrieved 16 May 2008. ^ "Rio hails 'admirable' Evra". Sky Sports. BSkyB. 23 January 2006. Retrieved 8 April 2011. ^ McCarra, Kevin (26 February 2006). "Rooney runs amok to wreck Wigan's dream". The Guardian. London: Guardian News and Media. Retrieved 16 May 2008. ^ "Finnan rejects racism claims". Sky Sports. BSkyB. 2 March 2006. Retrieved 8 April 2011. ^ "Finnan cleared of racist claims". Sky Sports. BSkyB. 5 March 2006. Retrieved 8 April 2011. ^ a b "Patrice Evra Footballdatabase.eu Profile". Footballdatabase.eu. Retrieved 1 June 2011. ^ "Evra targets regular spot". Sky Sports. BSkyB. 20 September 2006. Retrieved 8 April 2011. ^ "United too strong for København". UEFA.com. Union of European Football Associations. 27 October 2006. Archived from the original on 16 July 2012. Retrieved 8 April 2011. ^ Herbert, Ian (20 November 2006). "Sheffield United 1 Manchester United 2: Warnock hails 'King' Rooney after striker's majestic display". The Independent. UK. Retrieved 8 April 2011. ^ McNulty, Phil (29 November 2006). "Man Utd 3–0 Everton". BBC Sport. British Broadcasting Corporation. Retrieved 8 April 2011. ^ "United heading into last 16". UEFA.com. Union of European Football Associations. 6 December 2006. Archived from the original on 8 July 2012. Retrieved 8 April 2011. ^ McCarra, Kevin (22 January 2007). "Henry has the final word as United stutter". The Guardian. London: Guardian News and Media. Retrieved 8 April 2011. ^ Hughes, Ian (10 February 2007). "Man Utd 2–0 Charlton". BBC Sport. British Broadcasting Corporation. Retrieved 8 April 2011. ^ "Majestic United storm into semis". UEFA.com. Union of European Football Associations. 10 April 2007. Archived from the original on 8 July 2012. Retrieved 8 April 2011. ^ "Manchester United locks in Patrice Evra for another two years with contract extension". Bettor. 22 March 2011. Archived from the original on 27 July 2011. Retrieved 1 June 2011. ^ "Rampant Milan reach Athens final". UEFA.com. Union of European Football Associations. 2 May 2007. Archived from the original on 19 July 2012. Retrieved 8 April 2011. ^ "2006/07: Milan avenge Liverpool defeat". UEFA.com. Union of European Football Associations. 23 May 2007. Archived from the original on 10 July 2012. Retrieved 1 June 2011. ^ "The PFA teams of the year: from Premier League to League Two". theguardian.com. London: Guardian News and Media. 23 April 2007. Retrieved 8 April 2011. ^ "Evra retains focus". Sky Sports. BSkyB. 20 September 2007. Retrieved 8 April 2011. ^ "Van the man for United". TheFA.com. The Football Association. 5 August 2007. Retrieved 8 April 2011. ^ "Ronaldo lights up the night at Dynamo". The Guardian. Guardian News and Media. 24 October 2007. Retrieved 2 June 2011. ^ Murray, Scott (3 November 2007). "Arsenal 2–2 Manchester United". theguardian.com. London: Guardian News and Media. Retrieved 8 April 2011. ^ "Slick United ease through to last 16". UEFA.com. Union of European Football Associations. 7 November 2007. Archived from the original on 8 July 2012. Retrieved 8 April 2011. ^ McNulty, Phil (11 May 2008). "Wigan 0–2 Man Utd". BBC Sport. British Broadcasting Corporation. Retrieved 8 April 2011. ^ a b "United strike gold in shoot-out". UEFA.com. Union of European Football Associations. 22 May 2008. Archived from the original on 13 July 2012. Retrieved 8 April 2011. ^ "Evra puts pen to paper". ManUtd.com. Manchester United. 12 June 2008. Retrieved 12 January 2011. ^ "Evra pens Red Devils deal". Sky Sports. BSkyB. 12 June 2008. Retrieved 8 April 2011. ^ "Evra charged over Blues fracas". Sky Sports. BSkyB. 18 July 2008. Retrieved 8 April 2011. ^ "Duo deny FA charge". Sky Sports. BSkyB. 6 August 2008. Retrieved 8 April 2011. ^ Kay, Oliver (10 December 2008). "Sir Alex Ferguson in shock over Patrice Evra's four-game ban". The Times. UK: Times Newspapers. Retrieved 8 April 2011. ^ "Lucky 13 for United". TheFA.com. The Football Association. 10 August 2008. Retrieved 8 April 2011. ^ "Evra banned and fined by FA". Sky Sports. BSkyB. 5 December 2008. Retrieved 12 January 2011. ^ "Gamba Osaka – Manchester United FC". FIFA.com. Fédération Internationale de Football Association. 18 December 2008. Retrieved 2 June 2011. ^ "Liga Deportiva Universitaria de Quito – Manchester United FC". FIFA.com. Fédération Internationale de Football Association. 21 December 2008. Archived from the original on 2 February 2009. Retrieved 8 April 2011. ^ Winter, Henry (21 December 2008). "Manchester United cut Chelsea to pieces". The Daily Telegraph. UK: Telegraph Media Group. Retrieved 8 April 2011. ^ "United suffer Evra blow". Sky Sports. BSkyB. 13 January 2009. Retrieved 8 April 2011. ^ "Draw sees Manchester United retain title". CNN. 16 May 2009. Retrieved 8 April 2011. ^ "Man Utd 0–0 Tottenham (aet)". BBC Sport. British Broadcasting Corporation. 1 March 2009. Retrieved 8 April 2011. ^ "Ronaldo leads ruthless United to Rome". UEFA.com. Union of European Football Associations. 5 May 2009. Archived from the original on 8 July 2012. Retrieved 8 April 2011. ^ "Arsenal v Manchester United: 'Babies' were taught a lesson, says Patrice Evra". The Daily Telegraph. UK. 9 May 2009. Retrieved 8 April 2011. ^ "Stylish Barcelona take United's crown". UEFA.com. Union of European Football Associations. 27 May 2009. Archived from the original on 13 July 2012. Retrieved 8 April 2011. ^ Stafford, Mikey (27 April 2009). "Ryan Giggs wins PFA player of the year award". The Guardian. London: Guardian News and Media. Retrieved 18 December 2013. ^ Cheese, Caroline (9 August 2009). "Community Shield as it happened". BBC Sport. London: British Broadcasting Corporation. Retrieved 2 June 2011. ^ "Wolfsburg 1 United 3". Manchester Evening News. MEN Media. 8 December 2009. Retrieved 2 June 2011. ^ "Owen treble sinks Wolfsburg". Sky Sports. BSkyB. 9 December 2009. Retrieved 2 June 2011. ^ "FIFA/FIFPro World XI: The best defenders". FIFPro.org. FIFPro. 21 December 2009. Retrieved 8 April 2011. ^ "Team of the Year 2009". UEFA.com. Union of European Football Associations. 18 January 2010. Retrieved 8 April 2011. ^ a b "Evra proud to lift trophy". Sky Sports. BSkyB. 1 March 2010. Retrieved 2 June 2011. ^ McCarra, Kevin (28 February 2010). "Wayne Rooney seals Manchester United's Carling Cup comeback". The Guardian. London: Guardian News and Media. Retrieved 8 April 2011. ^ McCarra, Kevin (10 May 2010). "Chelsea and Carlo Ancelotti are worthy winners of Premier League title". The Guardian. London: Guardian News and Media. Retrieved 18 December 2013. ^ "United buckle under Bayern strain". UEFA.com. Union of European Football Associations. 7 April 2010. Retrieved 8 April 2011. ^ Taylor, Daniel (10 May 2010). "Manchester United try to spare Patrice Evra from French mutiny inquest". The Guardian. London: Guardian News and Media. Retrieved 2 June 2011. ^ "Evra, des excuses et c'est tout". lequipe.fr (in French). L'Equipe. 25 June 2010. Archived from the original on 25 August 2010. Retrieved 8 June 2011. ^ "Manchester United try to spare Patrice Evra from French mutiny inquest". BBC Sport. British Broadcasting Corporation. 25 June 2010. Retrieved 8 June 2011. ^ Hassan, Nabil (21 February 2011). "Real Madrid eye £20m move for Manchester United star Patrice Evra on Cristiano Ronaldo's recommendation". Daily Mail. UK: Associated Newspapers. Retrieved 21 February 2011. ^ "Patrice Evra eyeing up a move to Real Madrid?". ESPN FC. ESPN Internet Ventures. 6 November 2010. Retrieved 21 February 2011. ^ a b "Nicolas Anelka laughs at 'nonsense' 18-match French ban". BBC Sport. British Broadcasting Corporation. 18 August 2010. Retrieved 12 January 2011. ^ Winter, Henry (16 August 2010). "Manchester United 3 Newcastle United 0: match report". The Daily Telegraph. UK: Telegraph Media Group. Retrieved 8 April 2011. ^ Hassan, Nabil (20 November 2010). "Man Utd 2–0 Wigan". BBC Sport. British Broadcasting Corporation. Retrieved 12 January 2011. ^ Gracey, Jim (26 January 2011). "Manchester United in Evra stand-off". Belfasttelegraph.co.uk. Belfast Telegraph. Retrieved 21 February 2011. ^ Hassan, Nabil (21 February 2011). "Patrice Evra signs new contract with Manchester United". BBC Sport. British Broadcasting Corporation. Retrieved 21 February 2011. ^ "United check Marseille momentum". UEFA.com. Union of European Football Associations. 23 February 2011. Retrieved 8 April 2011. ^ Glendenning, Barry (23 February 2011). "Marseille v Manchester United – as it happened". theguardian.com. London: Guardian News and Media. Retrieved 8 April 2011. ^ "Liverpool 1 Manchester United 1: match report". Daily Telegraph. Telegraph Media Group. 15 October 2011. Retrieved 17 October 2011. ^ "Fergie: Evra to pursue complaint". ESPN FC. ESPN Internet Ventures. 17 October 2011. Retrieved 19 December 2013. ^ "Now prove it! FA to grill race row pair as Suarez denies Evra claims". Daily Mail. Associated Newspapers. 17 October 2011. Retrieved 17 October 2011. ^ Taylor, Daniel (16 November 2011). "Liverpool's Luis Suárez will plead not guilty to FA racism charge". The Guardian. Guardian News and Media. Retrieved 17 November 2011. ^ Jolly, Richard (24 December 2012). "Evra's belief in front of goal is paying off". ESPN FC. ESPN Internet Ventures. Retrieved 18 December 2013. ^ Ornstein, David (24 November 2013). "Cardiff 2-2 Man Utd". BBC Sport. British Broadcasting Corporation. Retrieved 18 November 2013. ^ Chowdhury, Saj (26 December 2012). "Man Utd 4-3 Newcastle". BBC Sport. British Broadcasting Corporation. Retrieved 19 December 2013. ^ Lewis, Aimee (18 December 2013). "Stoke 0-2 Man Utd". BBC Sport. British Broadcasting Corporation. Retrieved 19 December 2013. ^ "Evra extends United stay". ManUtd.com. Manchester United. 23 May 2014. Retrieved 23 May 2014. ^ Hibbs, Ben (21 July 2014). "Evra leaves United to join Juventus". ManUtd.com. Manchester United. Retrieved 21 July 2014. ^ a b "Manchester United: Patrice Evra joins Juventus for £1.2m". BBC Sport (British Broadcasting Corporation). 21 July 2014. Retrieved 21 July 2014. ^ "Barcelona see off Juventus to claim fifth title". UEFA. UEFA.com. 6 June 2015. ^ "Evra first to lose four Champions League finals". UEFA.com. 6 June 2015. Retrieved 26 November 2015. ^ Adam Shergold (26 November 2015). "Patrice Evra joins Champions League century club after making sub appearance in Juventus win over Manchester City". The Daily Mail. Retrieved 26 November 2015. ^ "Patrice Evra signs Juventus contract extension until 2017". Sky Sports. 6 June 2016. Retrieved 7 June 2016. ^ "Official: Evra joins Olympique Marseille". Football Italia. 25 January 2017. Retrieved 25 January 2017. ^ "Patrice Evra: French full-back joins Marseille from Juventus". BBC Sport. 25 January 2017. Retrieved 26 January 2017. ^ "Marseille's Patrice Evra sent off after aiming kick at fan". ESPN FC. 2 November 2017. Retrieved 3 November 2017. ^ "Evra sent off during warm-up for kicking own team's fan in head. (Vitoria Guimaraes 1 Marseille 0)". BBC Sport. 2 November 2017. Retrieved 3 November 2017. ^ "Patrice Evra: Marseille suspend defender after kicking fan during warm-up". BBC Sport. 3 November 2017. ^ "Patrice Evra leaves Marseille and is banned for seven months by Uefa". BBC Sport. 10 November 2017. ^ "West Ham signs Premier League great Patrice Evra". West Ham United Website. 7 February 2018. ^ "Patrice Evra makes West Ham United debut against Liverpool". Retrieved 24 February 2018. ^ "James Collins to leave West Ham United | West Ham United". www.whufc.com. Retrieved 20 July 2018. ^ "Les Bleuets pour la Slovénie et Malte". fff.fr (in French). French Football Federation. 3 October 2002. Retrieved 8 April 2011. ^ "Courte et précieuse victoire des Bleuets (1–0)". fff.fr (in French). French Football Federation. 11 October 2002. Retrieved 8 April 2011. ^ "Patrice Evra forfait pour le match face à Malte". fff.fr (in French). French Football Federation. 13 October 2002. Retrieved 8 April 2011. ^ "Patrice Evra: "Le plus dur commence"". fff.fr (in French). French Football Federation. 12 August 2004. Retrieved 8 April 2011. ^ "France v. Bosnia and Herzegovina Match Report". fff.fr (in French). French Football Federation. 18 August 2004. Retrieved 8 April 2011. ^ "France v. Israel Match Report". FIFA.com. Fédération Internationale de Football Association. 4 September 2004. Retrieved 6 June 2011. ^ "Faroe Islands v. France Match Report". FIFA.com. Fédération Internationale de Football Association. 8 September 2004. Retrieved 6 June 2011. ^ "Evra out for France". Sky Sports. BSkyB. 24 March 2005. Retrieved 8 April 2011. ^ "Evra reveals motivation". Sky Sports. BSkyB. 12 October 2007. Retrieved 8 April 2011. ^ "France v. Greece Match Report". fff.fr (in French). French Football Federation. 15 November 2006. Retrieved 8 April 2011. ^ "Domenech springs Gomis surprise". UEFA.com. Union of European Football Associations. 28 May 2008. Retrieved 8 April 2011. ^ "Abidal: "Evra? Je suis pour"". lequipe.fr (in French). L'Equipe. 10 June 2008. Archived from the original on 3 August 2012. Retrieved 8 April 2011. ^ "Eric Abidal wants more competition in team even if he loses place to Evra at Euro 2008". Taiwan News. 12 June 2008. Retrieved 8 April 2011. ^ "World Cup parallel heartens Abidal". UEFA.com. Union of European Football Associations. 10 June 2008. Retrieved 8 April 2011. ^ "4–2–3–1, Henry, Govou, Evra". lequipe.fr (in French). L'Equipe. 13 June 2008. Archived from the original on 6 September 2012. Retrieved 8 April 2011. ^ "Dominant Dutch progress in style". UEFA.com. Union of European Football Associations. 13 June 2008. Archived from the original on 24 May 2010. Retrieved 8 April 2011. ^ "France sunk as Italy grab lifeline". UEFA.com. Union of European Football Associations. 17 June 2008. Archived from the original on 16 November 2013. Retrieved 8 April 2011. ^ "Evra, Abidal, Vieira: mais qui se clashe sur cette vidéo?". Le Post (in French). 17 June 2008. Retrieved 8 April 2011. ^ "Evra: "Quel gâchis!"". lequipe.fr (in French). L'Equipe. 18 June 2008. Archived from the original on 4 August 2012. Retrieved 8 April 2011. ^ Garbett, Paul (22 June 2010). "World Cup 2010: Patrice Evra blasts Raymond Domenech as France depart South Africa". The Daily Telegraph. UK: Telegraph Media Group. Retrieved 8 April 2011. ^ "Austria v. France Match Report". fff.fr (in French). French Football Federation. 6 September 2008. Retrieved 8 April 2011. ^ "EVRA Patrice". fff.fr. French Football Federation. Archived from the original on 29 July 2010. Retrieved 7 April 2011. ^ "Valbuena makes his mark". ESPN FC. ESPN Internet Ventures. 26 May 2010. Archived from the original on 1 January 2014. Retrieved 8 April 2011. ^ "Evra to take French armband". ESPNsoccernet. ESPN Internet Ventures. 4 June 2010. Retrieved 8 April 2011. ^ Hytner, David (11 June 2010). "World Cup 2010: Ten-man Uruguay and France begin with stalemate". The Guardian. London: Guardian News and Media. Retrieved 8 April 2011. ^ Wilson, Paul (17 June 2010). "World Cup 2010: Mexico put France in peril with stylish victory". The Guardian. London: Guardian News and Media. Retrieved 8 April 2011. ^ "World Cup 2010: Nicolas Anelka sent home after bust-up". BBC Sport. British Broadcasting Corporation. 19 June 2010. Retrieved 13 July 2010. ^ "Brazil advances, Italy held to another WCup draw". Banderas News. Associated Press. 21 June 2010. Retrieved 13 September 2011. ^ "Communiqué de la FFF". fff.fr. France Football Federation. 20 June 2010. Retrieved 21 June 2010. ^ "Altercation Duverne-Evra". lequipe.fr (in French). L'Equipe. 20 June 2010. Archived from the original on 25 November 2010. Retrieved 8 April 2011. ^ "World Cup 2010: France stars 'may boycott match'". BBC Sport. British Broadcasting Corporation. 21 June 2010. Retrieved 8 April 2011. ^ "World Cup 2010: France players return to training". BBC Sport. British Broadcasting Corporation. 21 June 2010. Retrieved 8 April 2011. ^ Gleeson, Mark (22 June 2010). "France captain dropped in wake of player strike". Reuters. Retrieved 12 January 2011. ^ Hytner, David (22 June 2010). "World Cup 2010: South Africa beat red-faced France and both bow out". The Guardian. London: Guardian News and Media. Retrieved 8 April 2011. ^ "Lilian Thuram calls on France to ban Patrice Evra for life". theguardian.com. London: Guardian News and Media. 2 July 2010. Retrieved 8 April 2011. ^ Stevens, Howard (29 January 2011). "Evra must be banished from national side – says French minister". Daily Mirror. UK: Trinity Mirror. Retrieved 8 April 2011. ^ Grelard, Philippe (21 June 2010). "French football in chaos after players' mutiny". Agence France-Presse. Retrieved 17 March 2011. ^ "Nicolas Anelka given 18-match France suspension". BBC Sport. British Broadcasting Corporation. 17 August 2010. Retrieved 17 August 2010. ^ "Evra reflects on WC nightmare". Sky Sports. BSkyB. 10 August 2010. Retrieved 17 March 2011. ^ "Patrice Evra hauled before French Football Federation as he fires another swipe at senior figures". Daily Mail. UK: Associated Newspapers. 9 August 2010. Retrieved 17 March 2011. ^ "Evra and Ribery back for France amid discontent". Reuters. 17 March 2011. Retrieved 13 September 2011. ^ "Blanc omits Evra for Brazil friendly". Yahoo! Eurosport. Yahoo! News Network. 3 February 2011. Retrieved 6 June 2011. ^ "France work hard for win in Luxembourg". UEFA.com. Union of European Football Associations]]. 25 March 2011. Retrieved 13 September 2011. ^ "Franck Ribéry's return the sole excitement as Croatia frustrate France". theguardian.com. London: Guardian News and Media. 29 March 2011. Retrieved 3 April 2011. ^ "Yoann Gourcuff omitted as France announce Euro 2012 squad". The Independent. Independent Print. 29 May 2012. Retrieved 3 June 2012. ^ Mandeep Sanghera (23 June 2012). "Spain 2-0 France". BBC Sport. Retrieved 26 January 2017. ^ "Pogba leads France squad for Euro 2016 as Schneiderlin and Ben Arfa miss out". FourFourTwo. 12 May 2016. Retrieved 16 May 2016. ^ "Payet stunner gives hosts France opening win". www.uefa.com. 10 June 2016. ^ Dominic Fifield (8 July 2016). "Patrice Evra: how France have united behind unlikely father figure". The Guardian. Retrieved 9 July 2016. ^ Joseph Walker; David Crossan (10 July 2016). "Portugal 1-0 France". UEFA.com. Retrieved 11 July 2016. ^ "FIFA/FIFPro World XI: The best defenders". FIFPro. 20 December 2009. Retrieved 21 December 2015. ^ a b c Duncan Castles (19 October 2008). "Best of the left". The Guardian. Retrieved 21 December 2015. ^ "Fergie - Evra switch possible". Sky Sports. 24 August 2012. Retrieved 21 December 2015. ^ a b "Patrice Evra". ESPN. Retrieved 21 December 2015. ^ Jeremy Wilson (6 June 2015). "Juventus vs Barcelona - Paul Pogba wasteful in possession; Lionel Messi's vision was vital - how players rated". The Daily Telegraph. Retrieved 21 December 2015. ^ "The art of crossing in Serie A". La Gazzetta dello Sport. 26 August 2015. Retrieved 21 December 2015. ^ "Evra or Alex Sandro for Juventus?". Football Italia. 21 October 2015. Retrieved 12 August 2016. ^ "Evra on Tevez, Pirlo and formations". Football Italia. 12 August 2014. Retrieved 30 January 2017. ^ Jamie Jackson (10 July 2014). "Patrice Evra likely to join Juventus after asking to leave Manchester United". The Guardian. Retrieved 21 December 2015. ^ Dominic Fifield (22 April 2015). "Patrice Evra enjoying Indian summer at Juventus as he makes Monaco return". The Guardian. Retrieved 21 December 2015. ^ Taylor, Louise (27 January 2012). "Patrice Evra has come a long way from Marsala to Manchester via Monaco". The Guardian. Retrieved 2 February 2015. ^ a b c "Patrice Evra – "Je suis retourné au pays une seule fois pour me faire circoncire"" (in French). allAfrica. 8 June 2010. Retrieved 7 April 2011. ^ a b "Patrice Evra tacle Thuram" (in French). Afiavi. 13 August 2010. Retrieved 25 May 2011. ^ Kay, Oliver (23 July 2007). "Evra thanks God for a United shirt". The Times. UK: Times Newspapers. Retrieved 12 January 2011. ^ "Patrice Evra reveals racist abuse". ESPNsoccernet. ESPN Internet Ventures. 8 June 2010. Retrieved 8 April 2011. ^ "Patrice Evra: Juventus find allergy Manchester United missed". 12 November 2015. Retrieved 12 November 2015. ^ Boshoff, Alison (21 May 2008). "The War of the WAGSKIS: The real battle for Moscow". Daily Mail. UK: Associated Newspapers. Retrieved 12 January 2011. ^ Castles, Duncan (19 October 2008). "Best of the left". The Observer. London: Guardian News and Media. Retrieved 12 January 2011. ^ "One-on-one with Manchester United star Patrice Evra". CNN. Retrieved 30 June 2011. ^ "Patrice Evra denies Paris St-Germain's 'homophobic insults' claim". 20 March 2019 – via www.bbc.co.uk. ^ "Patrice Evra". StretfordEnd.co.uk. Retrieved 18 December 2013. ^ "Patrice Evra". LFP.fr (in French). Ligue de Football Professionnel. Retrieved 7 April 2011. ^ "Patrice Evra". Fédération Française de Football. Retrieved 8 July 2016. ^ a b c "P. Evra". Soccerway. Retrieved 3 December 2015. ^ "Patrice Evra: Overview". Premier League. Retrieved 16 April 2018. ^ "Trophées UNFP - Oscars du football - Meilleur espoir de Ligue". sportpalmares.eu. Retrieved 26 August 2014. ^ "Trophées UNFP - Oscars du football - Equipe-type de Ligue 1". sportpalmares.eu. Retrieved 26 August 2014. ^ "Ronaldo secures PFA awards double". BBC Sport (British Broadcasting Corporation). 22 April 2007. Retrieved 26 August 2014. ^ "Giggs earns prestigious PFA award". BBC Sport (British Broadcasting Corporation). 26 April 2009. Retrieved 26 August 2014. ^ "Rooney is PFA player of the year". BBC Sport (British Broadcasting Corporation). 25 April 2010. Retrieved 26 August 2014. ^ "Stars out for the World XI". FIFA.com. Fédération Internationale de Football Association. 21 December 2009. Retrieved 26 August 2014. ^ "Team of the Year 2009". UEFA.com. Union of European Football Associations. Archived from the original on 19 June 2014. Retrieved 26 August 2014. Wikimedia Commons has media related to Patrice Evra.